You know, Nintendo (and its numerous second-party development teams) have done a great job this gaming generation of producing downloadable titles that differ--creatively, meaningfully and significantly--from the titles that show up on store shelves. 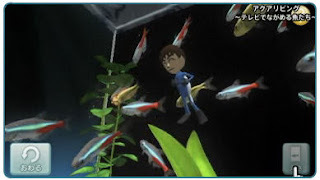 The DSiWare title mentioned in my last post is a great example of the above, as is the soon-to-be-released (in Japan) WiiWare title known as Aqua Living: The Fish You Can Watch On Your TV. Now, aquarium sims normally don't "do it" for me, but this one seems to be an exception to that rule. For starters, there are so many options they'll make your head spin: After selecting one of eight themes, users can alter the layout of their tank and populate it with fish (there are 40 types). Users can alter the background music (there are seven songs) and the wallpaper that appears behind their virtual aquarium, too. my Liza Minnelli Mii into the tank and force her to feed fish. That's not all: Users also are given a number of options when it comes to viewing their aquarium, including one that allows them to send in a Mii who can simply swim around or feed fish. Aqua Living will hit the Japanese Wii Shop Channel on March 8 with a price tag of 800 Nintendo points. Hopefully the title will swim into other territories soon. Huh. Still not doing it for me, I think.